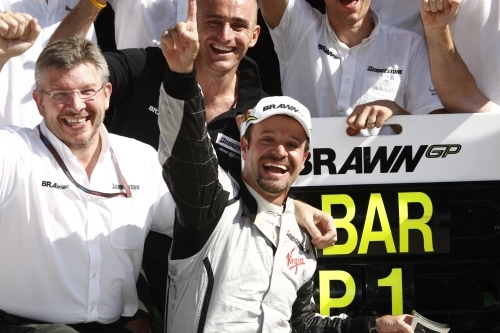 Rubens Barrichello won his first race for five years in Valencia yesterday with an extremely competent and popular victory in the European Grand Prix on the street circuit. Lewis Hamilton also had cause for celebration as he finished second, just 2.3 Seconds behind the BRDC Honorary Member. At the start of the race Lewis shot into the lead with Rubens in third. As the first pit stops began on lap 15 Lewis the first to come in, going back out in sixth. Red Bull Racing’s Sebastian Vettel had to make a double stop at the first set of pit stops due to a fuel rig problem, which played into the hands of BRDc Full Member Jenson Button as the Red Bull driver then came out behind the Brawn car. On lap 23 there were further problems for Sebastian Vettel whose suffered engine failure and sent him into retirement. With the rest of the field having pitted Lewis was back in the lead ahead of Rubens on lap 37 Lewis made his second stop, but there was a problem with his stop which then gave second placed Rubens an advantage as he took up the lead and Lewis went into fifth. Rubens maintained his lead following lap 40 stop. Jenson also managed to get ahead of Mark Webber to finish seventh and with Sebastian Vettel out of the race, this all helped Jenson's championship position as he now sits 22 points ahead of team-mate Rubens in the standings. BRDC Honorary Member Fernando Alonso finished in sixth place while Mark Webber was ninth.